Google's BigQuery tool includes a public data set (usa_names.usa in the query below) that contains 5,552,452 first names gleaned from U.S. Social Security applications between 1910 and 2013. 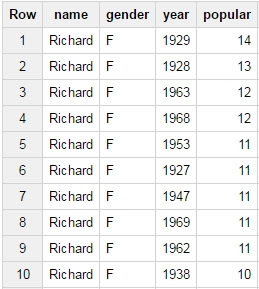 Querying that data shows that some women are named using traditionally male names like "Richard", the top years shown below. Perhaps Johnny Cash would not be surprised that ten baby boys have been named "Sue". Sigh ... what were they thinking?